One has to consider Todd McFarlane to be a trend-setter. For those of you unfamiliar with Todd, he was previously one of the most lauded comic artists in the late 80’s/early 90’s. Many were impressed by his comic art regarding Spider-Man, but eventually, he broke free and went to the start-up Image Comics with a number of other famous comic artists and writers. It was there that he created his own character named Spawn, and shortly thereafter, set out to change the face of action figures. From the quality sculpts and detailed paint jobs, other companies soon rose to compete, taking cues from McFarlane Toys. One of those was Palisades Toys, which soon began creating toys based on such popular properties as Invader Zim, and Ren and Stimpy. However, they were eventually able to secure one license that makes many remember them all these years later: The Muppets. Over the course of 4 years, Palisades crafted dozens of figures of different Muppet characters, and even went so far as to create detailed playsets (including one based around the backstage of The Muppet Show!). Sadly, bankruptcy in 2005 cancelled the future of the toy line, as well as the possible promise of figures based on other Henson properties like Sesame Street, and Fraggle Rock. The closest those other properties came to production were prototypes, and a convention-exclusive figure of Super Grover. During the early 2000’s, Palisades was no strange to exclusives, and they released numerous retail exclusive figures, as well as those offered through their Collector’s Club, and convention exclusives. 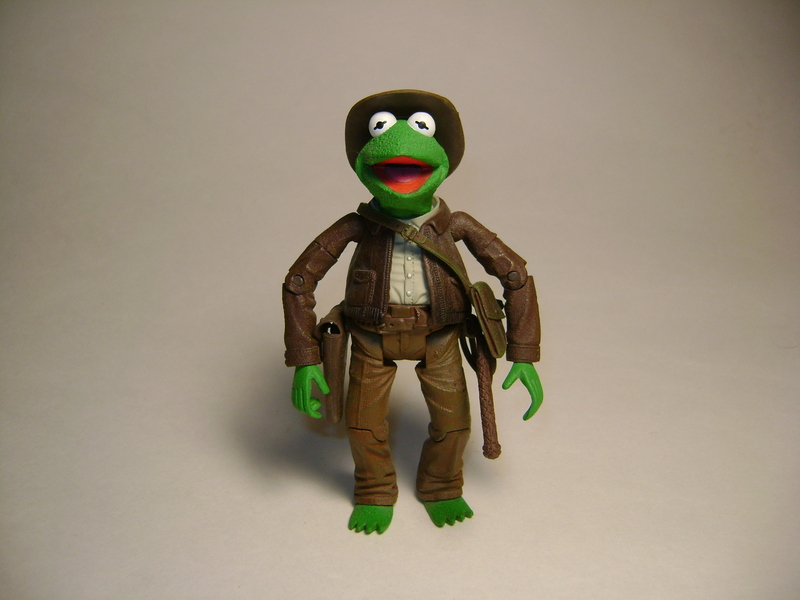 In 2004, I picked up one of these : Adventure Kermit. And in case some of you were wondering, any references to Henry Jones, Jr, were not to be found on the packaging due to copyright reasons. Even so, there was mention in Adventure Kermit’s bio, that he does like laws allowing for parody, and legendary film producers & directors with a sense of humor. 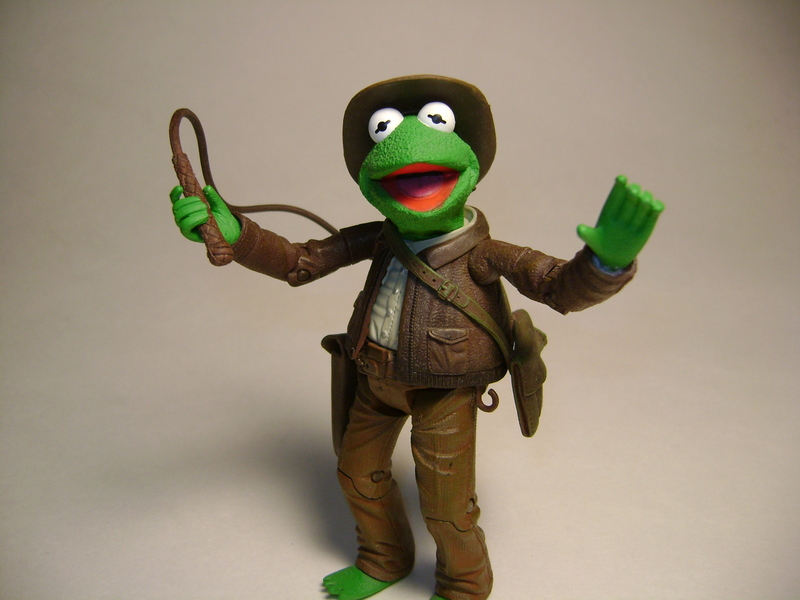 Kermit as Indiana Jones in The Muppets At Walt Disney World. 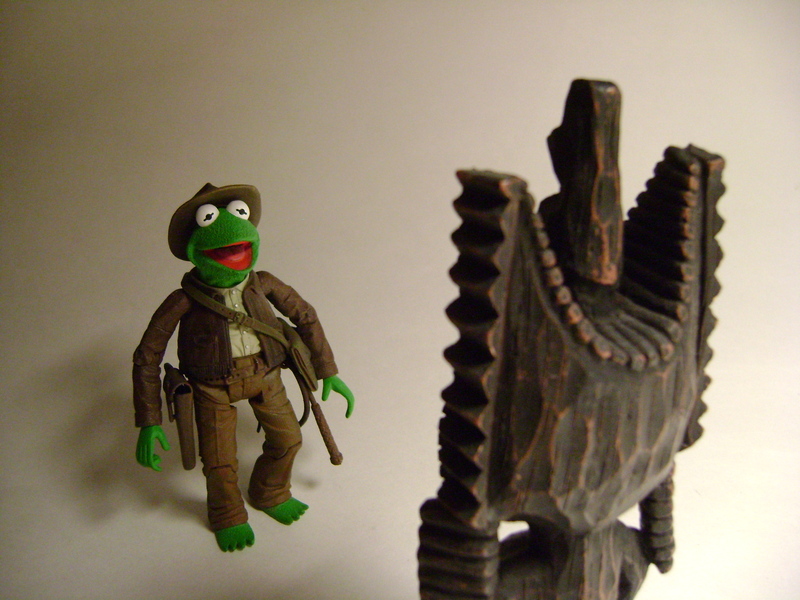 In case you weren’t aware, Kermit did dress up like Indiana Jones in 1990. During the TV Special The Muppets at Walt Disney World, Kermit takes part in the Disney MGM Studios’ Indiana Jones Epic Stunt Spectacular. Of course, Kermit was only shown from the waist up, and was outfitted with a very simple outfit. When Palisades decided to do their own version, it was as if someone had gone up to Lucasfilm, analyzed a screen-worn outfit, and sized it down to fit Kermit. The texture and detail on Kermit’s attire definitely makes this an exciting figure! 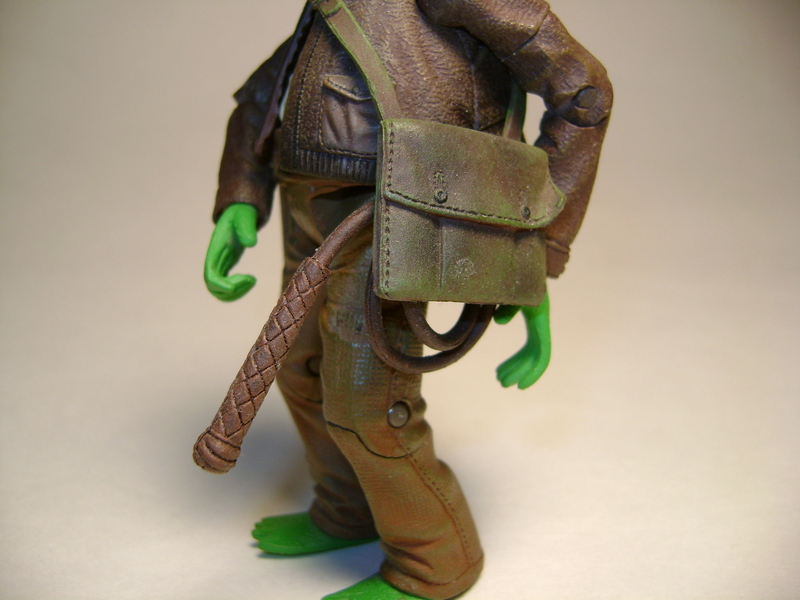 Several paint applications give character to Kermit’s satchel. Another surprise is the whip that’s included. Palisades could have just given us a coiled piece of plastic, but this item uncoils for Kermit to whip around, and a small hook on his belt allows one to coil it back, and attach it. 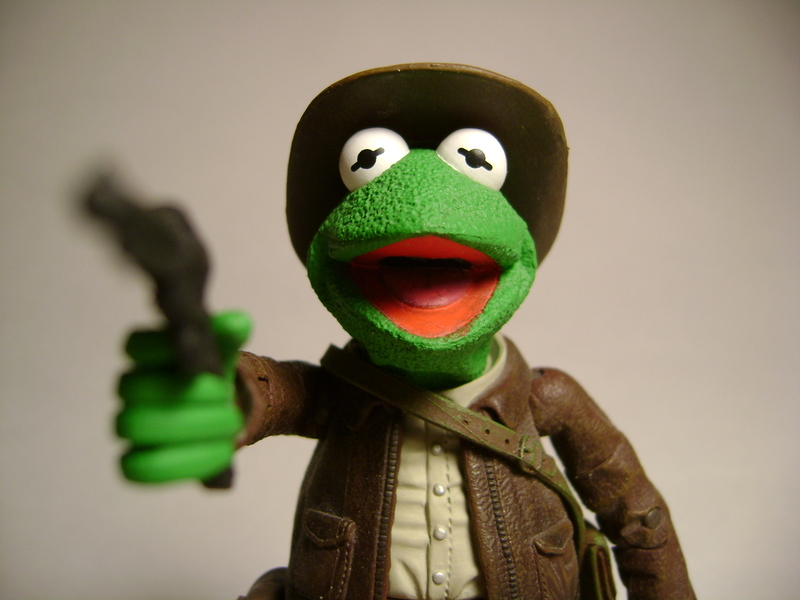 On the other side of Kermit’s waist is another fun accessory: an opening/closing holster, with an actual pistol in it! The pictures also shows more fine levels of paint detail in aging the holster. All right, Doc Hopper...do you feel lucky? This picture is a nice example of the texture that Palisades employed with Kermit’s ‘skin.’ While some would have gone with a nice smooth finish, the sculptors chose to give a texture that seems very much like the actual felt used to create Kermit. Of course, unlike a human head, Kermit’s doesn’t lend itself to having a hat sit nicely atop it. To prevent collector-frustration about perfectly balancing the hat atop the frog’s angled head, Palisades did the only thing possible: cut a hole in Kermit’s head, put a magnet inside, seal it back up, and then put another magnet in the hat. Pure genius! It should also be noted that this Kermit has the most articulated arms of the different Kermit figures released. While he does come with wrist, elbow, and shoulder joints, he also has a rotating joint in the middle of his upper-arm, that helps increase the poses his arms can make. One almost wishes added poseability would have been added to his legs. 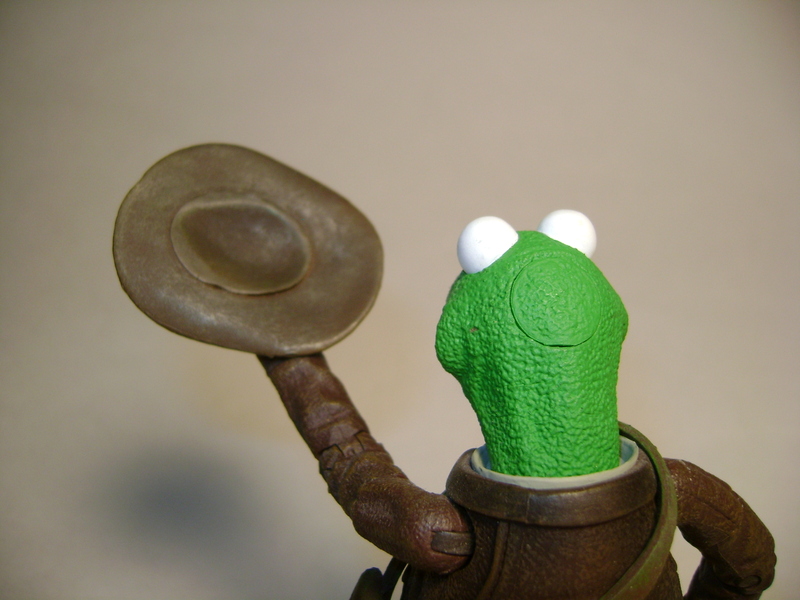 Due to the bow-legged angle of the legs, Kermit is saddled with just standing normally. If Kermit maybe had some rotation in his ankles, it would have helped. Even though he isn’t supposed to be named after a certain archaeologist, Adventure Kermit did come with a little artifact that he was after: The Golden Gonzo (or The Golden Weirdo, depending on who you talk to). The small gold statue featured a kneeling chicken’s body, with Gonzo’s head atop it (the less thought about that combination, the better!). Palisades even ran a contest in the summer of 2004, for a drawing to win a 8-12 inch version. Sadly, the one that Kermit was searching for appears to have disappeared from my collection. However, just enter Golden Gonzo into your search bar, and you should be able to find some photos floating around. Despite a few flaws here and there, this is still a great figure. I heard that there were several production runs of the figure, with varying differences in paint applications. One of the most significant, is one production run included gold paint on Kermit’s jacket zipper, and the clasp for his satchel. Personally, I prefer mine that isn’t so shiny-it makes our green adventurer look like he’s been using his gear for quite awhile. At the time this came out, we hadn’t had any Indiana Jones merchandise for years, so this filled a void with its peanut-butter-and-jelly combination of both Jones and The Muppets. Before the line died out, I did manage to procure a few more exclusive Muppet figures, and I can guarantee that one of them will be seen in an upcoming review…one figure that was so significant, I just couldn’t pass it up. This image is usually followed by a random child’s voice from the auditorium, who suddenly shouts out, “Totoro! !” While some in the audience wonder what the child just said, those of us who know of Totoro and the films of Studio Ghibli usually chuckle, or feel our own mouths widening into a grin as we sit back, and wait to see what the house of Miyazaki-san has in store for us. Adapted from Mary Norton’s story The Borrowers, The Secret World of Arrietty concerns a family of little people living in a small dwelling under the floorboards in a country house. The three-person family consists of Pod (the quiet, industrious father), Homily (the rather excitable mother/housewife), and Arrietty, their 14-year-old daughter, who has mainly lived under the floorboards, and ventured out into the garden nearby. One day, Pod decides that it’s time for Arrietty to join him on an errand to ‘borrow’ some items from the humans in the household. Their adventure is cut short when Arrietty is seen by a young boy who is staying in the house temporarily. Soon after, he leaves a cube of sugar she dropped, along with a small note, which causes Pod to consider that they may need to move away, given that they have been seen. Homily watches apprehensively, as Pod helps Arrietty prepare to go borrowing. One of the hardest things for Studio Ghibli, is its tendency to mainly release films under the direction of either Hayao Miyazaki, or Isao Takahata (Ghibli’s other co-founder, and director of the animated drama, Grave of the Fireflies). There have been only a handful of productions put out by the studio under other directors, but very few have involved the grooming of young persons to then start directing beyond just one film. The best of the non-founder-directed films in my opinion, was Whisper of the Heart, directed by Yoshifumi Kondo, and released in 1995. While Miyazaki had a hand in the screenplay, storyboarding, and producing departments, I still feel that Kondo’s vision was what really guided the film to being a wonderful ‘hidden gem’ in the Ghibli library. Sadly, he died in 1998, with Whisper the only film he directed. Since then, it’s been a rather hit-and-miss track record for Ghibli regarding other directors. Some shunned the rather stiffly-drawn The Cat Returns (a pseudo-sequel to Whisper), and Tales of Earthsea, a film directed by Miyazaki’s son Goro, that received largely mixed and negative reviews (Hayao himself also didn’t have very kind words in regards to his own son’s directorial debut). With Arrietty, Ghibli animator Hiromasa Yonebayashi moves into the director’s chair…and gives us probably one of the finest non-founders films since Whisper of the Heart (though Miyazaki does have a hand in the filmmaking process, serving as co-screenwriter, and executive producer). The human (bean) named Shawn relaxes in the garden of his Grandparents' house. The film places us in a country setting, with some lush and beautiful artwork that shows us why the Ghibli artists are some of the best at capturing the natural world. The world of Arrietty is also very intriguing and ingenious. If you are a fan of miniature items or stories where persons of different height use normal-sized objects, or create their own things, you might be in for a treat. The devices that Pod creates are very surprising. It’s also amazing to see how they treat various things that would seem ‘normal’ to us. When Homily pours tea, due to the density of liquid at their size, it comes out as blobbish droplets. Another surprise is when Pod and Arrietty go on their errand. Arrietty’s first venture into the house after dark is filled with sounds that assault her senses. The hum of a refrigerator, the sound of water going through pipes, even the ticking of a grandfather clock is amplified. It’s these little touches that really make this more than just a ‘shrunken persons’ story. With the human element of the film (or Beans, as the Borrowers call us), we have Shawn, a young boy who has been sent to the country house for a week. Aside from an Aunt who has brought him and visits him daily, the only other human companion Shawn has is the caretaker, Hara, a little woman who seems to feel there’s something going on inside the house. Character-wise, Shawn put me moreso in mind of Seiji from Whisper of the Heart, with a bit of the calming demeanor of Haku from Spirited Away. Even though I am a huge fan of Studio Ghibli, I am rather picky when it comes to dubbing, which is often the only way to see many of their films released in theaters stateside. Up until now, Howl’s Moving Castle was the benchmark for me regarding dubs (when Christian Bale can make Howl’s original Japanese voice sound mediocre, then you’ve got a sure-fire winner!). I can safely say that vocals director Gary Rydstrom does a superb job here as well (FYI, Gary was a sound mixer for Skywalker Sound, before he went to work at PIXAR). Arrietty shows her first borrowing to her mother, Homily. I was originally unsure about Amy Poehler being used for the voice of Homily, but it soon sounded right as Amy hit a number of Homily’s nervous rhythms to a ‘T.’ Will Arnett gives Pod a gruff assured sound, mixed in with little grunts or asides (Pod is sometimes not as vocal as Homily is). There is a mature playfulness that Bridgit Mendler gives Arrietty that keeps her from getting too close to the ‘loud-and-happy’ trap that some voice actresses can fall into with anime dubs. Probably of all the voices, it is David Henrie as Shawn that comes off sounding a bit too ‘mature’ for his appearance. My guess is the character of Shawn is around Arrietty’s age of 14, but he sounds moreso like he’s in his late teens. One nice little bit of casting is Carol Burnett as the housekeeper, Hara. She doesn’t have a lot of lines, but she does some wonderful little things with her voice that had the audience cracking up. The music also helps with a magical and memorable tone to the film. Those who are fans of Jo Hisaishi’s Studio Ghibli scores may seem a little disoriented, but if one gives themselves over to the music of composer/songwriter Cécile Corbel, they will find a musical journey into territory that sounds both ancient and country-like in tone. According to Cécile’s webpage (http://www.cecile-corbel.com/en/home.html), she is a big fan of the celtic harp, which is heard in a number of areas in the film. Her bio also mentions that Cécile is inspired by tales, ancient melodies and fairy moods, which are the basis of her musical world. That line alone proves that she was a perfect match for The Secret World of Arrietty. For those worried that we may get another auto-tuned remix for the Radio Disney crowd like the song at the end of Ponyo…you can breathe a sigh of relief. We do have Bridgit Mendler providing the final song in the credits, titled Summertime. It feels a tad out-of-place in the general scheme of the film, but nowhere near as bad as what one might imagine. Arrietty playfully relaxes with a little pillbug. Probably not since Spirited Away have I been afraid that a great little gem of an animated film will fall through the cracks. Like many works by Studio Ghibli, it feels like a tone-poem at times, which may make some sugar-induced children antsy. However, it’s a rare film that I found to be short-and-sweet, relaxing, and definitely more calm amid the months when action movies are released endlessly in hopes of snaring bored movie-goers. It’s interesting to note that it’s been 10 years since Spirited Away introduced many in the U.S. to the world of Studio Ghibli. Very little advertising was done, and it only showed on 151 screens. This weekend, Arrietty will have the biggest stateside opening for a Ghibli film, on over 1300 screens. A few weeks ago, I was surprised when I wandered into my local Disney Store, and a preview for Arrietty was playing on their main viewing screen! We’ve come a long way since 2002, and as my friend Donna wondered…is it only a matter of time before the likes of Totoro or Jiji may be sitting on Disney Store shelves next to Woody and Mickey? Author’s Note: I would be remiss if I did not thank my good friend, Donna Bohdanyk, for helping me obtain a pass to see The Secret World of Arrietty. Thank you Donna, for being a great friend, and for allowing me to introduce you to the world of Hayao Miyazaki’s work over 10 years ago. In 2004, Hayao Miyazaki released his follow-up to Spirited Away: an adaptation of Howl’s Moving Castle, based on the story by Diana Wynne Jones. Much like his adaptation of Kiki’s Delivery Service, Miyazaki took the basis of the story, and made it his own. While some viewers mentioned that there seemed to be a large anti-war statement in the film(it was made during the first few years of the Iraq War), one of the more memorable bits for me was the curse/spell placed upon the lead character, Sophie. The basis of the film and the original story by Jones, is the fact that the lead heroine is cursed to be an old woman, and how this affects her journey. While this may seem straight-forward in the original story, Hayao Miyazaki chose to use this as a storytelling tool in a way few could possibly imagine. Analyzing the film once it came out on DVD, I have come to the conclusion that there may be an undertone about accepting yourself for how you are, and not being judged by society’s standards. Many in Asia often wish to emulate the Western world regarding fashion, style, and beauty. One book I skimmed through called Aesthetic Surgery, showed a man who went through several surgeries so he could moreso resemble Keanu Reeves. In 2010, there was an article about a Chinese girl whose boyfriend was obsessed with Jessica Alba, to the point he wanted her to dress like Alba, and wear a wig. After breaking up with him after one year, she became so desperate to get him back, that she considered getting surgery to resemble Alba. There never was a solid conclusion to the news story, but my guess is if they didn’t report on any results, then the girl saw reason and decided not to do something so extreme. In regards to how vanity and appearance seem to fit into Howl’s Moving Castle, let’s start our journey. In the opening scenes of Howl’s Moving Castle, we are introduced to Sophie. With her brown hair and brown eyes, Sophie seems to look rather ‘plain.’ In one scene before she leaves to visit her sister, she poses in front of a mirror wearing a hat. She tries to look sunny and cheerful, but her expression turns dour as she considers her appearance. Her trip to see her sister is rather uneventful, as almost noone seems to notice her. Aside from some soldiers in a side alley who seem more than ready to take advantage of her, Sophie is surprised when a handsome man with blonde hair and blue eyes (aka Howl) escorts her away, and then leads her on a stroll through the air (note: some have equated the sensation of love to ‘walking on air’). From here, we find ourselves in the town’s bakery, where Sophie’s step-sister Lettie works. Much like Howl, Lettie also sports blonde hair and blue eyes. It almost seems that these are the traits one needs for attractiveness, or an image of rare beauty. This is exemplified perfectly in our introduction to Lettie, as we see her surrounded by many men. If you look closely, there isn’t a blonde male among the group. Lettie manages to get away, and goes to speak to Sophie, who still seems to be in a slight swoon over her encounter with the mysterious man she met. What’s interesting to note is that throughout the entire scene with the two sisters, no one seems to take notice of Sophie. Every other person seems to just acknowledge Lettie or greet her. Even Lettie’s outfit is much more colorful than her sister’s. After returning to the hat shop, Sophie is surprised when a woman enters. After examining the shop, the woman proclaims both it and Sophie as ‘tacky,’ leading Sophie to demand the woman leave. It is then that the woman reveals herself to be the Witch of the Waste, a powerful sorceress who then casts a spell on Sophie, aging her into a 90-year-old woman. Sophie is at first upset by these changes (as would anyone, I imagine), but when she wakes up the next day, she has gotten over them. In a strange manner to some, Sophie doesn’t seem to mind her appearance, even commenting that her choice of dress now seems to suit her better. Even with these changes, Sophie takes leave of the hat shop, and embarks on her own adventure. Sophie’s 90-year-old appearance stays the same for quite some time, even after she finds Howl’s castle, and encounters Howl, his assistant Markl, and Calcifer the Fire Demon. Being a Demon, Calcifer sees through the Witch of the Waste’s spell, of which an added side-effect is that Sophie is unable to tell anyone about her curse. The first time we see any change in Sophie’s appearance comes after Howl returns one evening, and sees her asleep. Here, she has reverted back to her youthful features, yet Howl never speaks of this aloud, or reveal what he’s seen. Sophie’s appearance while awake continues with the appearance of old age, until she vists Court Sorcerer Madame Suliman, at Howl’s request. Eventually, Sophie speaks positively and defends Howl, and as she does so, without realizing it, she ages back to her own appearance. However, this is quickly ‘remedied’ when Suliman guesses that she secretly loves Howl. It appears that her emotions and caring for Howl just may be the key to breaking her spell…but, is it actually enough? In a pseudo-dream sequence, Sophie reverts to her younger self, and encounters Howl, who appears to have become a large winged demon. This is the only instance where we hear his knowledge of her curse (“You, can’t even break your own spell”). When Sophie tells him that she loves him in the pseudo-dream, he claims she’s too late, and flies off. As the dream ends we see Sophie isolated in the darkness, her appearance old once again. The next day, Howl decides to create a new location for them to move to…which happens to be the former hat shop where Sophie once lived. Sophie is shocked to see the old shop again, not to mention a bedroom Howl has provided for her, where she used to make hats before. She briefly reverts to her younger self, albeit with silver hair, but it isn’t until he reveals the location of what appears to be a floating garden, does she seem to almost completely let herself go. At this point, she seems so happy and content, that one has to wonder if Howl possibly knows of a way to break her spell. After all, he’s returned her to a familiar place she knows (the hat shop), and has given her a gift of the garden as a place to go to whenever she chooses. However, the moment is broken when Sophie starts to lose faith in herself, feeling she’s not pretty, and only good as an old cleaning woman. It is in this moment that Howl admits that she is beautiful, but her doubt has taken hold so tightly, that she reverts all the way back to her 90-year-old appearance. After the events in the garden, Sophie’s appearance back in the castle and the hat shop appears to not be so old. I would say her age is closer to 60 or 70. It could be that this is a sign that maybe what Howl said to her has started to have some effect on her. Eventually, the town is evacuated as the war nears its borders, but Sophie and the denizens of Howl’s castle stay behind. However, the war soon comes close to endangering her new ‘family.’ This time, Sophie’s age reverts to her younger appearance. From here on out, Sophie seems more concerned regarding her ‘family’s’ safety, and her thoughts and worries about her appearance are all but forgotten. What’s really nice to see is that during these transformations, Miyazaki has made it so almost noone remarks about this. Even Markl, who so far has seen Sophie in several varying stages of age, seems unperturbed. Sophie has rarely done anything major on her own, but when Howl saves the hat shop from being bombed, and then flies off to protect it from the myriad bombers and planes flying overhead, Sophie springs into action, breaking the connection of the castle with the hat shop, which causes the castle to collapse into myriad pieces. This is just one step in Sophie’s plan: with the connection severed, she attempts to get Calcifer to restore the castle, and take them to Howl, in hopes this will prevent him from getting hurt in the attack…or that his magic will make him more monster than man. It is at this point, Calcifer asks Sophie for part of herself to help him complete her request. As Howl gave his heart to Calcifer as part of their deal, the fire-demon needs something of Sophie’s in order for him to do her bidding. Though Calcifer suggests her eyes (one assumes that the more valuable a portion of a person, the stronger their power over Calcifer is), Sophie instead gives him the braid of her hair. After it has been removed, the remainder of her now shoulder-length hair fans out. This could also be seen as another symbol of Sophie casting aside some of her vanity, or at the very least, achieving a new level of maturity. Miyazaki used this type of symbolism in Laputa: Castle in the Sky, when the young protagonist Sheeta has her pigtails shot off by the villain, Colonel Muska. The final piece of Sophie’s journey, comes when she reunites Howl with his heart (freeing Calcifer, and breaking his spell connecting him to Howl). And in turn, Sophie is freed from being ruled by vanity, or feelings of outward appearances. This moment comes when Howl admits that her silver hair is beautiful. Instead of being disturbed or disbelieving of this statement, she embraces Howl, and claims she loves her look too. Some messageboards I’ve been to have wondered why Sophie’s hair did not turn back to its original brown color. My theory is that this is a side-effect of the curse the Witch of the Waste placed on Sophie. In Miyazaki’s worlds, some curses will not leave you 100% complete once they have been lifted. One example is Ashitaka in Princess Mononoke. Though the curse that was consuming his arm is lifted at the end, scars still remain, almost as a reminder. In the end, Sophie has triumphed over her negative feelings regarding her appearance, and through her journey, has met someone to whom she has helped as well, and gained a new and magical family in the end whom she cares for, and who has grown to care for her, regardless of her appearance. …But wait, it isn’t over yet. Sophie isn’t the only one who made a change. Stay tuned for an upcoming blog post, where we examine the evolution of Howl. After an absence of almost a decade, Star Wars returned to toy aisles in 1995. Several old toy molds were dusted off and repainted, but the action figures were definitely not like what I had played with prior. Aside from the beefcake men and the monkey-faced Leia, the line eventually started to evolve, and we got some really interesting characters, including some that we probably never thought we’d ever see made. Almost 16 years later, the line is still producing figures, and has branched into other Star Wars-based areas, like The Clone Wars, and The Expanded Universe. With the impending release of Episode I in theaters, I got a bit nostalgic for my older collecting days, when I’d use my newly-acquired driver’s license to head out to the local Discount Stores and search for the new figures. From 1995-2000, the revitalization of the Kenner action figure line was titled Star Wars: Power of the Force. However, seeing as this was the last iteration in the mid-80’s before the original line went defunct, many collectors have named the re-introduction in 1995, Star Wars: Power of the Force 2 (or POTF2). For this posting, I’ve included my Top 5 figures from the Star Wars: Power of the Force 2 line. Please be advised that this Top 5 only takes into account the Basic figures, and not deluxe figures, mail-away exclusives, or multi-packed figures. So, let’s look back a long time ago, and start the countdown! I will admit, the fifth spot on this Top 5 caused me alot of consternation. While my original instincts were to go with the ASP-7 Droid created for the A New Hope: Special Edition (he was the first figure based on a computer-generated creation in a SW film), I eventually went back to kindly ol’ Aunt Beru. What’s so special about her? Well, not that much…except she comes with a pitcher and glass of blue milk (well plastic blue pieces shaped like these things)! Her clothing just screams the 70’s, but I did like the detail they gave to her collar material, not to mention that she’s a minor character that is part of Luke’s journey to Jedi Knighthood. 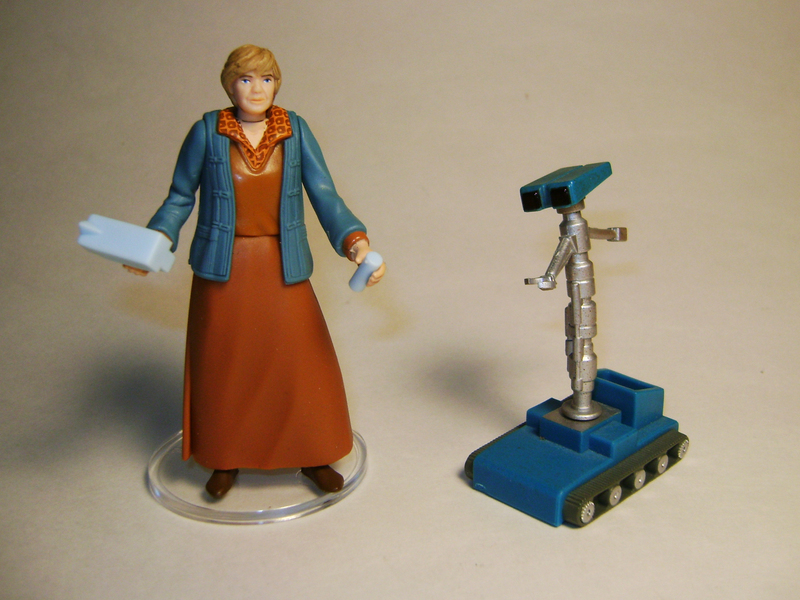 Unlike most action figures, Beru wasn’t one to jump about or fire a blaster, but the fact that Kenner made a character like her, shows that not every figure in the line has to be action-oriented. A few years down the line, they would do something similar when the Power of the Jedi action figure line-up would include Anakin’s Mother, Shmi Skywalker. Kenner did create a figure of Luke’s Uncle Owen, but he was only offered in a 3-pack with Luke and C-3PO. Plus, the amount of detail didn’t compare with what Kenner did in 1999 with Beru. Old white men in gray suits talking politics. While suited bad guys had taken the form of an Imperial Commander and a Star Destroyer Commander, the main decision-making guys hadn’t gotten their own iterations…yet. As a kid, I often glossed over the scene with Tarkin and Motti, but years later, I really enjoyed it, as it offered a slight glimpse into how the galaxy far, far away was bring run (dissolving the Imperial Senate, Regional Governors, etc). While Darth Vader was the front-and-center bad guy when it came to marketing, he largely glossed over the subtly-powerful Grand Moff Tarkin. It was Tarkin who ordered Vader to stop choking Admiral Motti, and ordered the destruction of Alderaan. Tarkin’s toy release in 1997 was so mind-blowing, that a special sticker was added to the toy’s plastic bubble, telling how it had Never Been Offered Before in any Kenner Collection. Admiral Motti was the brash gray-suit who insulted Vader’s ‘sorcerer’s ways,’ and led to our first glimpse of force-choking powers. Toy-wise, Motti’s toy was one of the first that used an elbow-hinge. 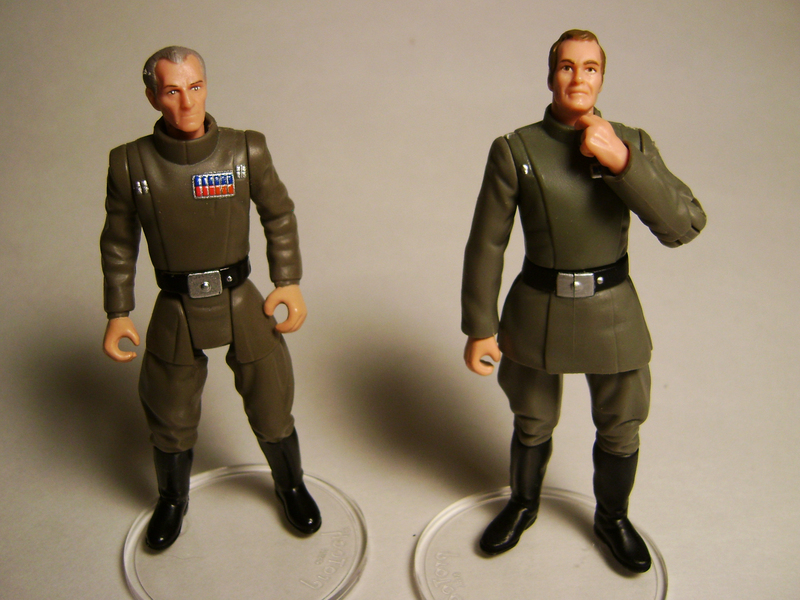 Rather than just lock his left arm in a fingers-to-throat pose, Kenner gave fans this rather exciting option of being able to give the Admiral a more neutral pose when he wasn’t insulting a Sith Lord. After Obi-Wan Kenobi sliced off Walrus Man’s arm in the cantina in Star Wars, most probably didn’t think Lucas would carry on with appendage mutilation in his films, let alone towards his main characters. 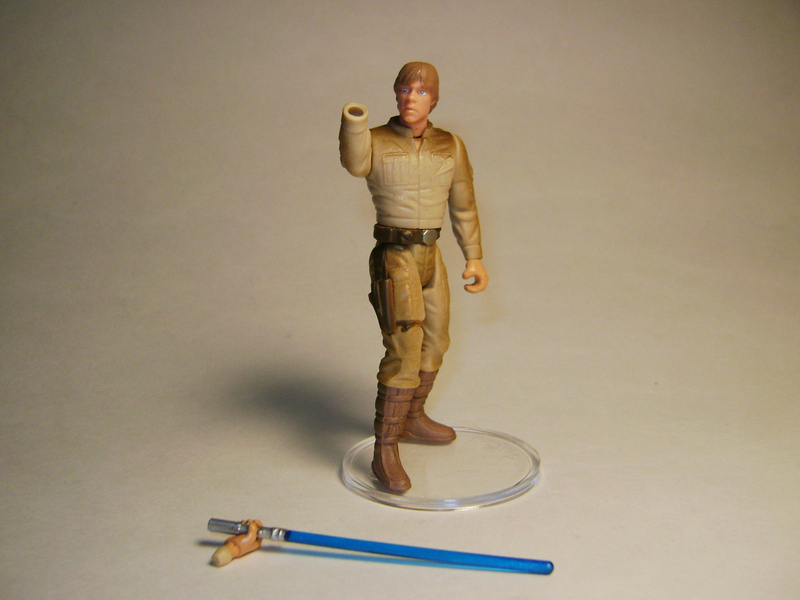 The ability to give a figure this feature had been done with another figure in 1998 (hint: it’s also on this Top 5 list), but the fact that they gave Luke a plastic-pegged, removable right hand made this one of my most-remembered figures from that time. It also allows one to re-enact one of the most mind-blowing moments in the series: he loses his hand, his Father’s lightsaber, and then finds out the guy who killed his Father…IS, his Father. This was one action figure that I don’t think anyone felt would ever be made. However, as the late 90’s started seeing an action figure revolution (such as McFarlane Toys‘ scantily-clad Angel/Warrior named Angela), one can’t help but figure Kenner saw this as their cue to launch this iteration of Leia. The only accessory she comes with is a chain and collar, remnants of here enslavement by Jabba the Hutt. At the time she was made, the plastic clothing and action stance didn’t make her easy to fit into various vehicles in the action figure line, but as a display/statue figure, she looks just fine. Hasbro would later make a couple other iterations of Leia with better articulation, but this one I still have after all these years. Plus, one can’t help but feel she paved the way for other scantily-clad Star Wars girls, like Jabba’s green-skinned dancer, Oola. Word was, this version of Darth Vader was one of the most-requested figures that people asked Kenner to make. 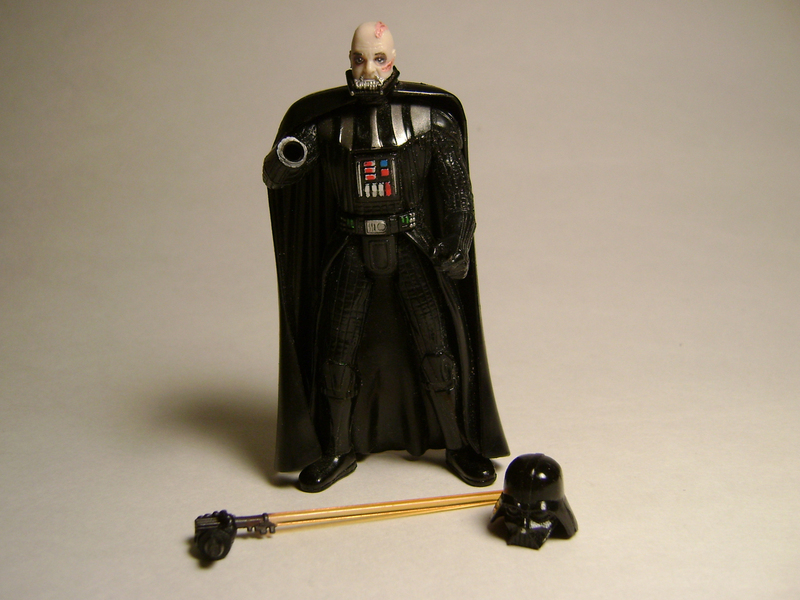 3 years after the POTF2 line started, this Vader appeared in the toy aisles in the Spring of 1998. Unlike the film version, Vader’s helmet only comes off in one piece, but at the time, I felt this was just one of the coolest figures that had been made of him. Also, he’s sporting pre-2004 bushy eyebrows (with the re-release of the films on DVD in 2004, those bushy eyebrows were digitally removed). Also to add to his injuries, his right hand is removable, so you too can re-enact Luke’s violent retribution against his Dad for considering to subvert Leia to the Dark Side. In actuality, the figure isn’t really ‘new,’ just updated. He uses the same body as the Darth Vader figure introduced in 1995. A little added extra is that he has a swivel-elbow joint on his right arm. Much like Leia as Jabba’s Prisoner, the removable helmet Vader has been redone several times since 1998. The most recent Vintage Collection release gives us the removal of all 3 parts of the helmet, but even with that feature, I still hold onto this Vader with a sense of nostalgia. And there you have it, my first blogged top 5 list regarding some of my Star Wars figures. Given that 2012 is kind of a big year for the series (the re-release of The Phantom Menace, the tenth anniversary of Attack of the Clones, and the 35th anniversary of A New Hope), I think it’s safe to say I’ll have a couple more reviews/analysis throughout the year for the saga.